Case Study: Creation of a website aimed at those interested in health and increase traffic with SEO. Products & Services: Health information and content. When someone mentioned the idea of having us help to create a website that was entirely about content and aimed at those interested in a healthy lifestyle, we jumped at the opportunity. Although the revenue model was a bit “iffy,” (revenue generated mostly by advertising), we knew that we could create a large site, where we also supplied most of the content, the SEO, and on-going Social Media management. One of the conditions was that information had to be well researched and claims made needed to be backed up by evidence. This was actually one of the motivations of the website in the first place: To provide honest information to those interested in health foods, supplements and a healthy way of life in general. There are far too many websites on the internet in the health niche that make bold claims about products, foods and supplements with zero evidence. After working out the initial costs and revenue deal, we jumped into the creation of Healthy, Happy, Beautiful! And we’ve seen some great results over the two years of its existence. 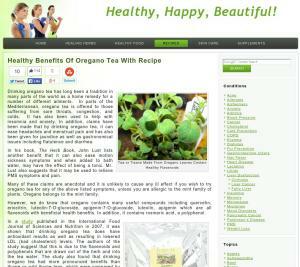 It was important to organize the website so that articles could be multi-categorized. From a health perspective, it was vital that various foods and supplements that have shown good evidence for a variety of medical conditions, could easy be found from looking at a medical conditions category. Additionally, the foods and supplements articles also needed to be in a branched format as different claims or known benefits were examined individually. Having good organization goals from the beginning was helpful in achieving this. The content that was provided had to be of extremely high quality and backed up by scientific study, and if claims were made where no scientific studies could be found, it was required that it be noted. One of the problems with many alternative health industry claims is that often, claims are made which are not backed up; but we also realize that sometimes, the reason there is no scientific evidence is simply because no studies have been performed. In those cases, we noted overwhelming evidence of anecdotal evidence. Anecdotal evidence cannot be dismissed out of hand. One of the major issues with many websites aimed at the health conscious internet user are very poor quality articles written more for search engines than for providing genuine education. The goal was to be seen as different than that, and not just provide “lazy” content, with only search engines in mind. We ensured that there was a professional level of work that goes into the content. A social media strategy was also employed that included a wide variety of social media platforms (no, Facebook is not enough, and in fact you might be surprised by what we learned: Twitter is vital when done in certain ways. Twitter can generate more traffic than Facebook posts. But it takes work and time.). Another important part of creating the site was when discussing things like fermented foods, our writers needed to experiment first. While other sites might tell you how to do something, we needed to know ourselves if some things were “easy” to do at home, or if we could duplicate claims made. This then, became an important consideration in the content creation; it had to be testable by our writers before they wrote about it. There are some things that need improvement going forward, but we’re happy with the way the way things have turned out for our client and we’ve been proud to be a part of it.